COLUMBIA, S.C. — No. 17 South Carolina softball started the day by retiring its first jersey in program history and closed it with a 5-1 victory over No. 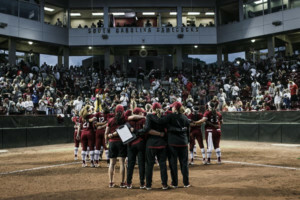 4 Alabama on Saturday night at Carolina Softball Stadium at Beckham Field. Dixie Raley threw a complete-game to get the win as the Gamecocks tied the series against the Crimson Tide at 1-1. Carolina took a 1-0 lead in the first and never looked back as the program earned its second top-five win of the season. The Gamecocks drew 2,156 fans to the contest. That mark is good enough for the largest crowd since 1997 and the second-biggest in program history. 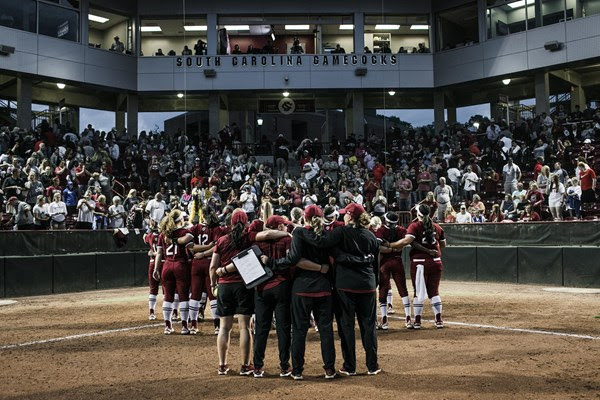 The last time Carolina had a crowd that big Trinity Johnson, who had her jersey retired tonight, was leading the Gamecocks to a 1-0 victory over Kansas. South Carolina (27-11, 4-9 SEC) took its first lead of the series just four batters in as Cayla Drotar singled home a run to give the Gamecocks a 1-0 lead. Both teams traded a scoreless second and third before Lauren Stewart doubled home a run to extend the lead to 2-0 through four. From there, three runs in the fifth capped with Mackenzie Boesel’s seventh home run of the season extended the lead to 5-0 in favor of the Gamecocks. Alabama (38-3, 8-3) got a run in the sixth but it wasn’t enough as Raley shut down the Crimson Tide the final six outs to secure the victory. Raley (9-2, 3-2) went all seven innings with just five hits and two strikeouts. Boesel, Jana Johns and Stewart all had multi-hit games as Stewart and Boesel plated two runs. Drotar, Kennedy Clarkand Madison Owens also added hits in the win. With the win, Carolina improved to 3-1 on the season when playing on national television. South Carolina moved to 4-9 against ranked opponents this season and 2-3 against top-five teams. The Gamecocks had three multi-hit performances tonight, the most in an SEC game this season for Carolina. Carolina improved to 15-5 in home games this season with the win on Saturday night. After tonight’s game Lauren Stewart, Kennedy Clark and Jana Johns are leading the way with three multi-hit games in conference play. Jana Johns and Kenzi Maguire kept their SEC-reached base streak going and have now done so in six-consecutive games.